THE ACADEMY IS A CHANCE. LEARN ABOUT THE SECRETS OF CUSINE. Are you a beginner or an experienced chef? We welcome everybody. We welcome those who fear the day when parents-in-law are expected for lunch or all those who had long ago given up on baking bread by themselves ... or cooking three-course lunch ... not to mention baking a cake. We welcome also those who are far and wide known for their culinary skills, but still do not sleep well a day before the guests are invited, or those who need a whole day to cook lunch... "Of course", you’ll argue, "the dishes I cook are demanding ..."
We believe that your dishes are yummy, but let us tell you a little secret: we can teach you how to cook faster and how to enjoy time with your guests instead of standing in the kitchen and hope that the roast will remain crunchy. Let us discover easier ways to make your dishes finger licking good. 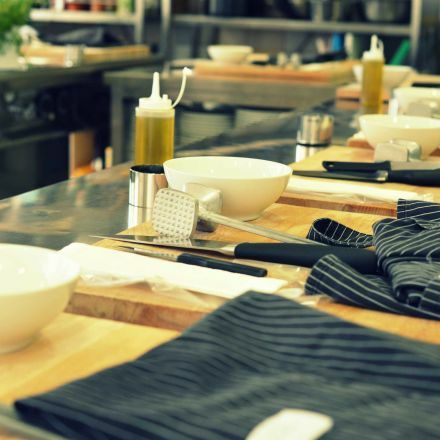 Join us on culinary experience and discover Jezeršek Academy! Jezeršek family says, "Teaching of culinary skills is in our blood." Our desire to launch a project like this one - Jezeršek Academy - grew in our minds for a very long time. Teaching is so to say in our blood - Franci and Sonja, the pioneers and founders of the company, met in the school: Sonja was a student and Franci her teacher. Together, they have created a successful catering company with more than 30 years of tradition in the field of catering, built Jezeršek House of Culinary Arts and Dvor Jezeršek. Cook in a real restaurant kitchen. When Dvor Jezeršek opened in 2007, our wish to educate and spread the culinary knowledge started coming true. There are two kitchens on the premises of Dvor Jezeršek; while the one of gostilna is in everyday use, the restaurant kitchen is seldom in use and therefore represents a perfect place for culinary workshops and unforgettable cooking experiences. Each and every participant will find something, no matter whether you're a beginner or an expert - Jezeršek Academy is the perfect place for those who want to learn something new and find new, innovative ideas for preparing dishes. Read more about our culinary programs, attend a professional training or organize a team building workshop for your company.